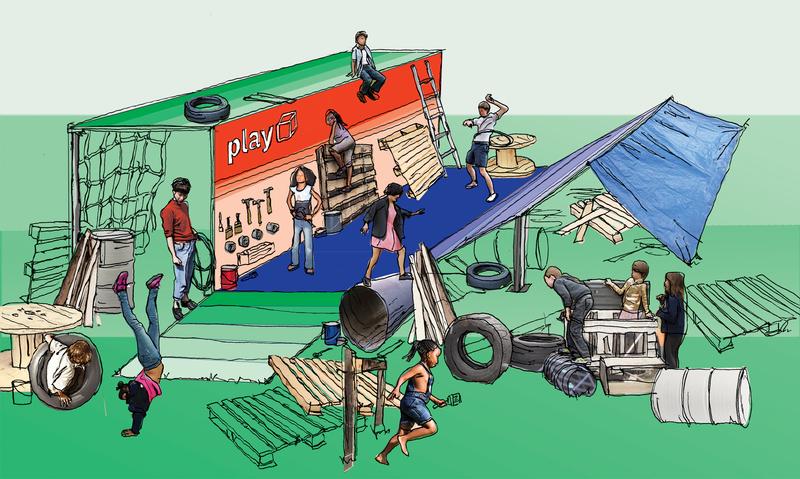 PlayBox is a conceptual play space designed for temporary use across New Zealand communities. The space and surrounding experience is built upon the philosophies of adventure play; and was a response to my research into New Zealand's current state of play. NZ’s current state of play leaves a lot to be desired, Grant Schofields ‘State of Play’ report found that 47% of NZ kids time outside of school was spent plugged in. This lack of play, and overuse of technology impacts their everyday wellbeing and happiness and has more serious longterm effects in worst case scenarios (Andrea F. Taylor & Frances E. Kuo, 2006). 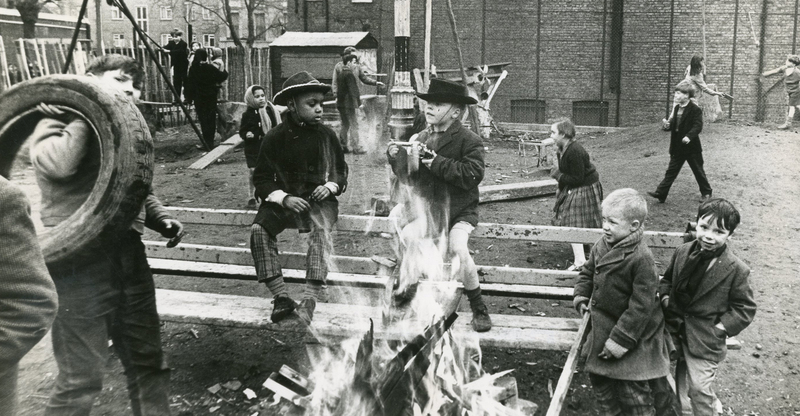 Adventure play has a rich history dating back to 1950's post-war Britain when Lady Allen of Hurtwood first observed kids choosing to play in the rubble of bombed buildings than the play spaces provided. This prompted her to start the first adventure playground; a space where kids were put back in control of their space, and in charge of their play — encouraged to build, get messy and most importantly, take risks. Notting Hill Adventure Playground. London, 1960. Adventure play has since been established as a recognised play philosophy. It is about free, unstructured, unguided play away from constant parental supervision. The adventure playground is characterised by “loose parts” (Simon Nicholson, 1972) — objects and spaces that allow appropriation by the child. This is enhanced in adventure playgrounds with the addition of tools, putting kids completely in charge of the play space and introducing risk. Risk is proven to be a crucial aspect to play and ultimately the development of a child. Safety is taken into account by the inclusion of play-workers — adults on the site tasked with facilitating the best possible play for kids with little interruption or direct involvement. They are there to keep an eye on safety, removing hazards but allowing, even encouraging, taking risks. All parents can get behind something that is good for their kids. The problem is, adventure playgrounds don’t look all that good on the surface. The junkyard, low-fi presence seems to prompt more concern than intrigue, and its many benefits are not made obvious. To hit the largest gamut of parents, adventure play needs a rebrand. 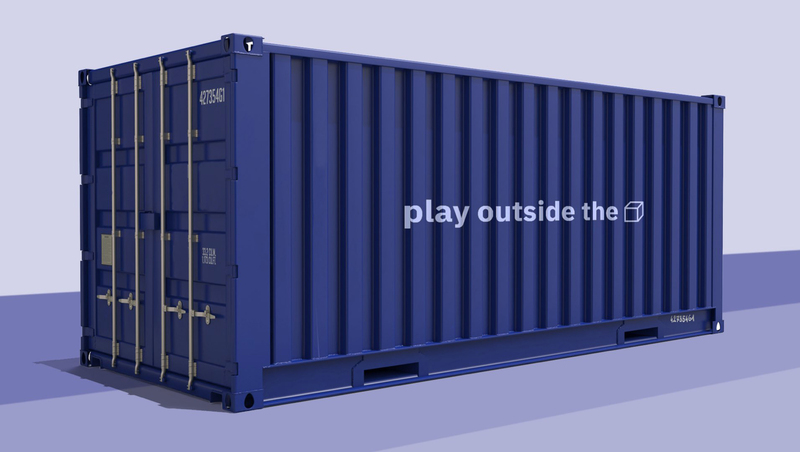 PlayBox aims to package adventure play so that the brand is seen before the playground. This legitimises the necessary chaos of the play space and gives us the chance to inform the parents as to why adventure play is so good for their children. 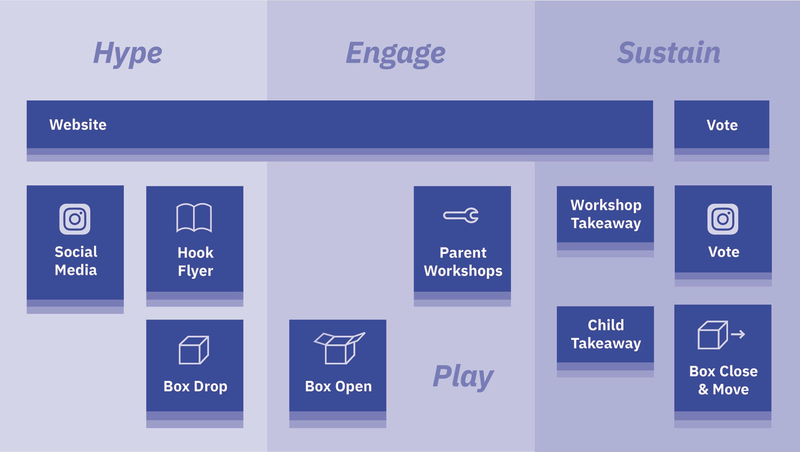 The PlayBox journey follows a three stage, cyclic process. Hype is generated in the chosen community through intrigue and social media activity. It then moves on to the actual engagement with the space, as well as engagement with the local community through workshops. These workshops are the beginning of phase three: sustain. 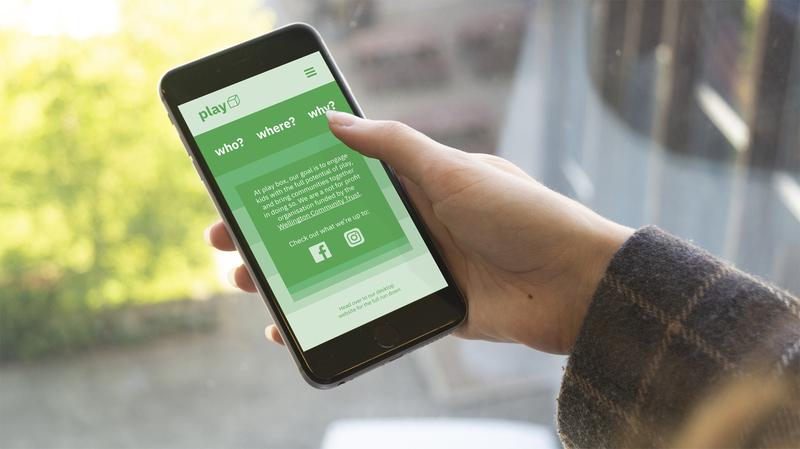 These are measures put in place to sustain the learnings of PlayBox. The journey repeats after the voting process has been carried out, deciding which community PlayBox will visit next. PlayBox, in its unopened, transport-ready state. PlayBox, in its open, play-ready state. Materials donated by local businesses and scavenged throughout the community. Prior to the box opening, flyers are sent out to the surrounding neighbourhood. 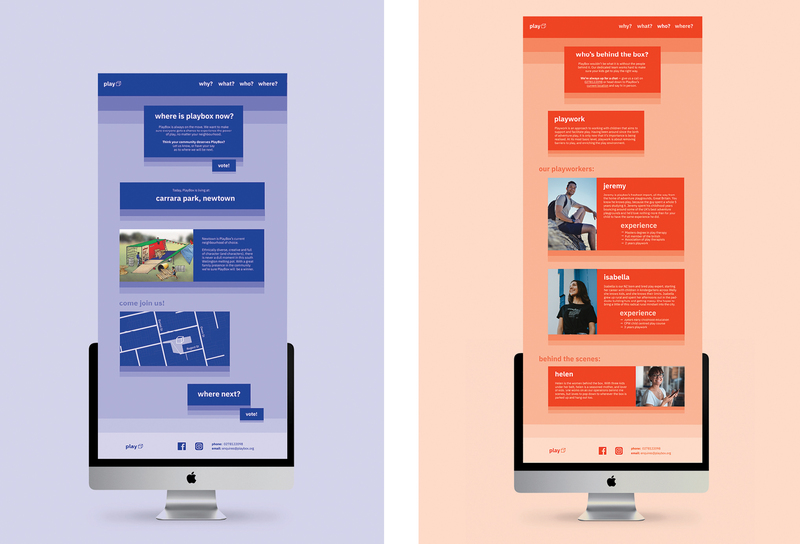 The website serves as the main hub for all information surrounding PlayBox. Its purpose is to inform, validate and reassure parents that PlayBox is right for their kids. It is also the platform for the voting process. 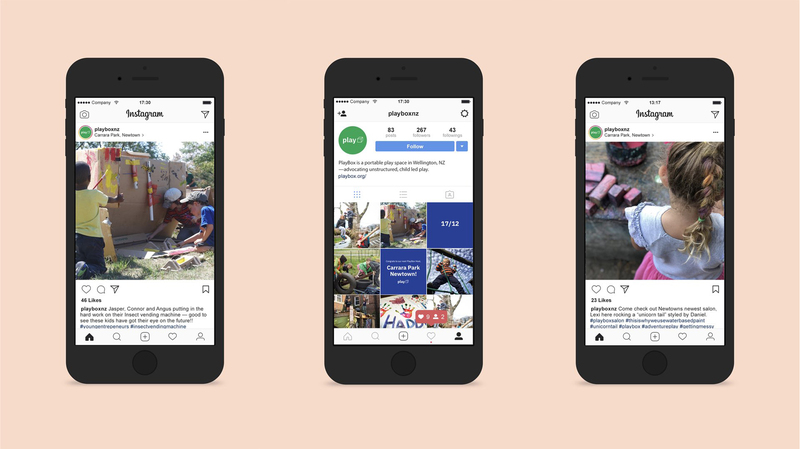 Social media will play a huge part in all three stages of the journey. Assisting the voting process, and then announcing the winner; keeping parents posted with any workshops or updates with the box; and also posting little insights into a day at PlayBox. Parental posting will be encouraged and the use of hashtags will help the online community build. 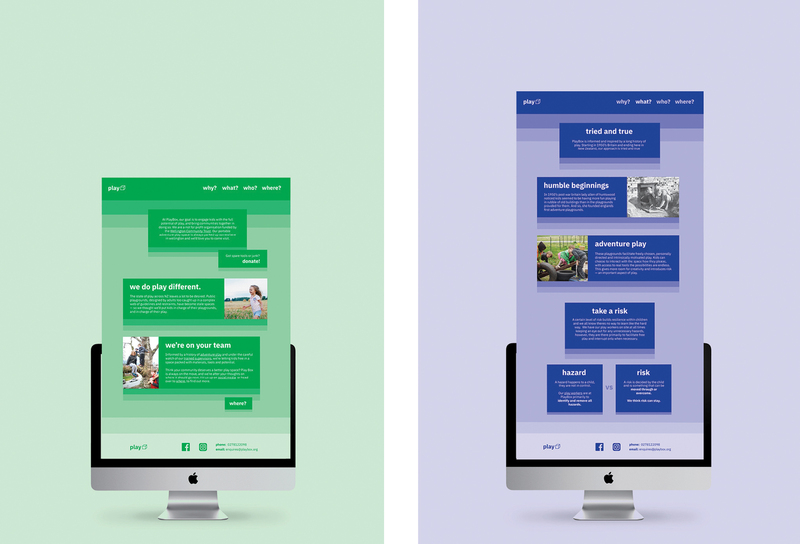 Tone of voice will be especially important on these platforms so that people get the right feel for the organisation: fun and friendly, but clued up.